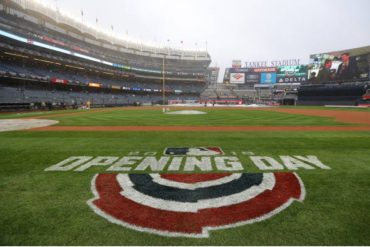 Ever since the Brooklyn Dodgers and the New York Giants left town, the phrase “Subway Series” has only been used when talking about Major League Baseball history. It seemed like the Yankees and the crosstown Mets where never good at the same time. That wasn’t the case when the city was a three-team town. 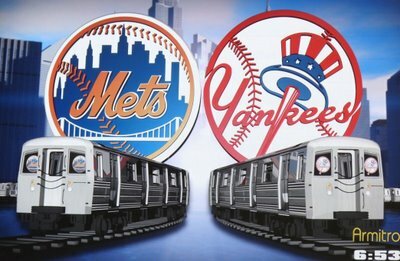 The first Subway Series took place in 1921 when the Giants and Yankees met for the first of three straight World Series matchups. The two would meet again in 1936, 1937, and 1951. The Yankees and Dodgers played each other in their first Subway Series in 1941. The two teams faced off again in 1947, 1949, 1952, 1953, 1954, and 1956. The Yankees dominated both of their city rivals, winning 10 of the 12 World Series in which they met (4-1 vs. Giants, 6-1 vs. Dodgers). Then the two NL squads moved west and the Subway Series went with them. That is … until the year 2000, 38 years after the Mets were born in 1962. At the time, the Yankees were the two-time defending world champions and had captured three titles in four years. The Mets were a franchise on the mend, making their first World Series appearance since their renowned 1986 squad. The Mets had reached the playoffs a year earlier and defeated Arizona in the Division Series before losing a tough NLCS battle to Atlanta. Playing in the World Series was tough enough, but playing against each other added extra pressure to both teams. And, of course, Yankees owner George Steinbrenner NEVER EVER wanted to lose to the Mets. To him, it didn’t matter whether it was a Grapefruit League game or a charity event, let alone the World Series. The Yankees and Mets first started meeting in Interleague Play in 1997, with the Mets winning the first game 6-0 behind pitcher Dave Mlicki. 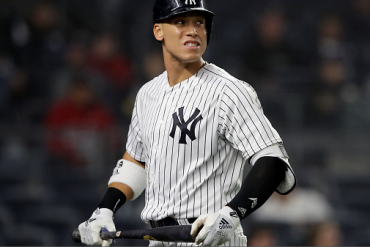 But, the Yankees captured the next two games of the three-game series, which was played in the Bronx. The Yankees won two of three again in 1998, this time at Shea Stadium. The matchup was expanded to six games in 1999, with both teams taking two of three at home. That season also marked the first time that both teams had made the playoffs in the same year. The prelim leading up to the Subway Series included a 2000 day/night doubleheader where one game was played at each team’s ballparks. The squads split two games at Yankee Stadium in June with one game rained out. So, they made up the rainout when the two teams met again a month later for the Shea Stadium Series. After a Friday night win, the Yankees beat the Mets 4-2 twice on Saturday. First, in the afternoon contest in Flushing (with former Met Doc Gooden winning for the Yankees) and then again at night at Yankee Stadium. The Mets took the final game of the series 2-0 on Sunday. But the Saturday evening game set the tone for the rivalry for the next couple of years, and eventually for the World Series. The Mets’ best hitter, Mike Piazza, stepped to the plate to lead off the top of the 2nd inning and was beaned in the head by the Yankees’ Roger Clemens. Up to that point, Piazza had owned Clemens and had hit a grand slam off “The Rocket” in June. Clemens downplayed the incident, sticking with the narrative that he was merely trying to pitch inside and didn’t intentionally hit the Mets’ catcher. Piazza wasn’t buying it. He said he would no longer respect Clemens. Thankfully, Piazza wasn’t seriously injured. With the All-Star break beginning on the following Monday, he missed only one game. It’s extremely rare for the first game of a World Series to be the turning point of the series, but in 2000 that’s exactly what happened. The game began as a pitcher’s duel between the Mets’ Al Leiter and the Yankees’ Andy Pettitte. The two matched zeros through five innings and then the pivotal play that might have changed the game and the Series took place. Timo Perez led off the top of the 6th with a single and two batters later Todd Zeile belted a two-run home run. Or, so Perez thought. He jogged around the bases with his fist extended in celebration … until reality hit. The ball had hit just below the top of the left field fence and was still in play. Perez raced for home as left fielder David Justice threw the relay to Derek Jeter. The Yankees’ shortstop made an off-balance throw home to nail Perez for the third out of the inning. Perez wore the “goat horns” while Jeter added another milestone to his burgeoning legacy. Saved by their defense, the Yankees got on the board first in the bottom half of the inning. Jose Vizcaino led off with a single, and one out later Jeter drew a walk. David Justice brought them both home with a double to the gap in left-center field. The Mets answered right back in the top of the 7th inning. With one away, the Mets loaded the bases on singles by Benny Agbayani and Jay Payton, and a walk to Todd Pratt. Pinch-hitter Bubba Trammell then tied the game with a single. Two batters later, the Mets went ahead on Edgardo Alfonzo‘s infield single off reliever Jeff Nelson. Leiter and reliever John Franco blanked the Yankees in the 7th and 8th innings. That meant it was time for Mets manager Bobby Valentine to call in the Mets’ closer aka the Yankees public enemy #1, Armando Benitez. He earned and kept that distinction ever since he intentionally drilled Tino Martinez in the back in 1998. Benitez retired Jorge Posada to start the 9th inning, but Paul O’Neill walked to win a 10-pitch battle. Luis Polonia delivered a pinch-hit single and Vizcaino loaded the bases with another single. Chuck Knoblauch’s sacrifice fly tied things up and sent the game into extra innings. 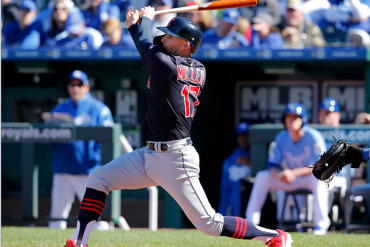 The game remained tied until the Yankees came to bat in the bottom of the 12th inning. With one out, Martinez singled off of reliever Turk Wendell and Posada followed with a double. After an intentional walk to O’Neill, Wendell retired Luis Sojo on a foul pop up. That brought up Vizcaino, who had come through twice in the game already. In his at-bat in the 12th, Vizcaino wasted no time, lining Wendell’s first pitch to left field for the game-winner. A surprise addition to the starting lineup, Vizcaino rewarded manager Joe Torre’s faith in him with a four-hit game. There was plenty of buzz before Game 2 since it was the first time Piazza and Clemens would be facing each other since July’s beaning. As awful an incident as that was, Game 2’s action was simply off-the-wall. Hitting third in the order, Piazza came to bat in the top of the 1st inning. With the count 1-2, Clemens threw inside. Piazza’s bat got sawed off in his hands as he swung, with a large piece of the barrel sent flying towards Clemens. Piazza started to run towards first base but abruptly stopped when he saw Clemens pick up the broken barrel and fire it in his direction. It turned out that the ball was foul and so was Clemens’ actions. The benches quickly emptied as Clemens said “I thought it was the ball” to Piazza … which is crazy, since why would you throw the ball at the hitter rather than to first base? Had it been a regular season game there is no doubt that Clemens would have been ejected from the game. Once the tempers settled down, Clemens retired Piazza on a tapper to second. If the incident fired the Mets up, you would never have known it. Clemens threw eight dominant innings, limiting the Mets to just two hits, and struck out nine batters. Only one Mets’ batter reached second base. Clemens did hit Alfonzo, but it was clearly not intentional. 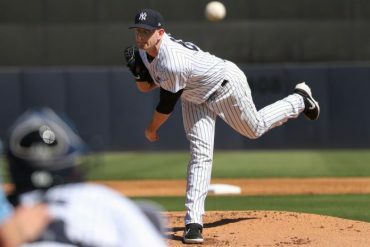 Meanwhile, the Yankees hammered Mets’ starter Mike Hampton early and often. The left-hander retired the first two batters in the bottom of the 1st inning, but issued walks to David Justice and Williams. Martinez and Posada followed with RBI singles for a 2-0 lead. Scott Brosius led off the 3rd with a solo home run and the heart of the order pushed across another run in the 5th. Martinez reached on a two-out double and the Mets elected to intentionally walk the switch-hitting Posada to face O’Neill. The decision backfired when O’Neill lined an RBI single to right for a 4-0 Yankees lead. With the way Clemens was pitching, the tack on RBI by Brosius and Martinez seemed meaningless. The Mets looked like they might have their own version of Game 1 when they rallied in the 9th against Jeff Nelson and Mariano Rivera. Nelson faced three hitters and didn’t retire one of them. He surrendered a two-run homer to Piazza and was sent to the showers after Robin Ventura followed with a single. Agbayani reached on a one-out single to put two aboard. With two away, the Yankee Stadium crowd suddenly went silent when Payton hit a three-run home run off Rivera to the short porch in right. A commanding lead was suddenly down to one, but Rivera struck out Kurt Abbott to end the ball game. The teams went to Shea Stadium with the Yankees up 2-0 in the Series. Robin Ventura’s solo home run off Orlando Hernandez in the 2nd inning of Game 3 gave the Mets their first lead since Game 1. It didn’t last long, though. Justice doubled in the tying run in the 3rd against Rick Reed. One inning later, O’Neill tripled in the go-ahead run but the Yankees left the bases loaded. El Duque had been virtually untouchable in his three postseasons with the Yankees, but the Mets got to him in the 6th inning. Piazza reached on a ground-rule double and Ventura followed with a walk. Zeile then doubled in the tying run. Hernandez walked Agbayani to load the bases but wriggled out of further trouble. In the 8th, Zeile singled and came home on Agbayani’s double to put the Mets back in front, 3-2. Two batters later, Trammell added insurance with a sac fly off Mike Stanton. Benitez closed it out in the 9th to put the Mets back in the Series. Game 4 was another tightly contested battle but it didn’t start out that way. With fans barely in their seats, Derek Jeter hit Bobby Jones‘ (the right-handed one) first pitch into the left field bleachers for a 1-0 lead. In the 2nd, O’Neill tripled, and two batters later came home on Brosius’ fly ball. Jones fell behind Jeter 2-0 in the third and the Yankees’ captain ripped the next pitch for a triple. Sojo delivered him with a groundball out for a 3-0 Yankees advantage. Meanwhile, Yankees starter Denny Neagle pitched like he had been walking a tightrope in a high wind. He stranded three baserunners through the first two innings but with one aboard in the 3rd, Piazza smashed a two-run home run off him. Neagle stranded another Mets baserunner in the 4th but when Piazza stepped up to bat with two outs in the 5th, Torre took no chances. Neagle was unhappy, some onlookers were surprised, but no one could blame Torre for going to the bullpen. 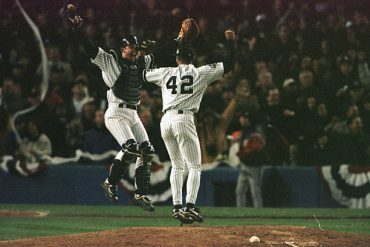 At this point, David Cone wasn’t the same pitcher he once was – he recently stated the Yankees won the 2000 World Series in spite of him – but Torre brought him in to face Piazza, and “the hired gun” came through. Piazza skied to Williams to end the frame. It was Cone’s only Series appearance and his last game as a Yankee. The Yankees bullpen then put the game on lockdown. Nelson and Stanton combined to toss two scoreless innings and Rivera recorded a six-out save to put the Bombers ahead 3-1 in the Series. Game 5 was a rematch of the Game 1 starters, Pettitte and Leiter. The Mets had the man on the mound they needed if they were going to send the Series back to the Bronx. After a scoreless 1st inning, Williams led off the 2nd with a solo blast to put the Yankees on top first. But, the Mets responded quickly. Trammell reached on a one-out walk and Payton followed with a single. Abbott bounced out but both runners advanced. Leiter pushed a bunt past the mound that Martinez fielded cleanly, but it appeared he had trouble gripping the ball. His flip to Pettitte arrived at the same time the Yankees hurler reached first base. 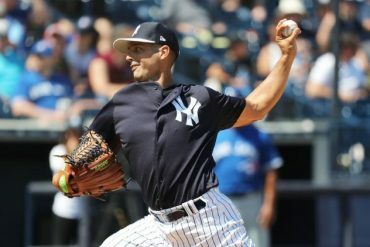 It turned out to be a bad combination of events for Pettitte, who dropped the ball for a run-scoring error. The Mets then took the lead when Brosius couldn’t barehand Agbayani’s slow roller on the left side of the infield. The Shea faithful went wild hoping for more, but Alfonzo popped out to end the inning. Leiter put zeros up on the board through the 5th inning as did Pettitte, who escaped a two-on, two-out jam in the bottom of the 5th. Then Leiter got spitting mad, literally. With one out in the 6th, Leiter fell behind Jeter 2-0 and the shortstop made him pay. Jeter’s second home run of the Series and fourth of the postseason tied the game at two apiece. Leiter kicked the mound and spat as Jeter’s swing sent the ball over the 358-foot sign and into the left field bullpen. The score remained tied as the game entered the 9th inning. Leiter still stood atop the mound for the Mets after 121 pitches. He struck out left-handed hitters Martinez and O’Neill to start the inning but walked Posada. Brosius’ line drive single to left moved Posada into scoring position. Pitch #142 ended Leiter’s night. Sojo swung at Leiter’s first offering and hit a bouncer back up the middle. It passed the mound and perfectly went past the middle infielders, (SS) Abbott and (2B) Alfonzo, who both dove in vain. Unfortunately for Payton, his throw from centerfield arrived at home plate at the same time as Posada. The ball hit Posada as he scored and it ricocheted into the Mets’ dugout. Brosius was awarded home plate with a huge insurance run. Franco came on to retire pinch-hitter Glenallen Hill to finally end the inning. In the bottom of the 9th, the Mets brought the tying run to the plate after Agbayani reached on a one-out walk. Alfonzo flew out to right for the second out, leaving it up to the Mets’ best power-hitter, Piazza, to try to tie the game against Rivera. The Mets’ catcher put a charge into one, but not enough of one as Williams recorded the putout in deep centerfield. It was game, set, and match for the Yankees. In the time since then, Leiter has jokingly said that Sojo’s ball bounced anywhere from 20 to hundreds of times. Jeter won the World Series MVP Award to go with the All-Star MVP Award he had won during the Summer. And, equally as important to the Boss, he and the Yankees owned the town. Prior to the Series, Agbayani was a guest on the Howard Stern Show and predicted the Mets would win the World Series in five games. He got it half right.